The discovery of tiny bones in the hem of a wedding dress is strange enough, but to then ascertain that they are a baby’s bones is enough to turn a simple break-in into a full scale investigation for the Guards in Dublin. Detective Cathy Connolly and her boss Inspector O‘Rourke have their work cut out for them tracking down answers to solve this grisly case. Throw in the mysterious appearance of a fugitive killer from Las Vegas, who is intent on tying up loose ends in Dublin and the Guards have more than enough to deal with. This is the first of instalment of the Garda Cathy Connolly series and it definitely doesn‘t hold back. The writing it superb, the plot is interesting and gripping, characters are multidimensional and easy to relate to. The various elements of the story are well written. Masterfully weaving together the tales of Mary‘s past and present dementia like struggles, Zoe‘s world slowly falling to pieces around her and the personal life of Cathy Connolly mixing with her professional duties. It would be easy to assume that something would get lost in the myriad of characters and details but as far as I was concerned, nothing did. The detail in this book was incredible, even the intricacies of the art work created by Zoe was thoroughly detailed, so much so that I could almost imagine the canvases. The chemistry and camaraderie between Connolly and O’Rourke is a delight to read, they are a great pairing, and the hints to their shared history open up the opportunity for Sam Blake to go so many ways with this series, I cannot wait to see what she has for us with book two. Secrets and lies rarely follow a linear path, the ones in this book scaled the chart of complexity and just when you thought that the secret was as dark as it got, another layer is peeled away and for some characters the truth was too much to bear. With so many twists and turns, both expected and unexpected, this book is entirely engrossing. I enjoyed this book so much that at just over half way in I was already recommending it to friends that I thought would appreciate it. You can buy a copy of Little Bones here. When Lady Margaret Wright (local girl made good) dies, her will stipulates her wake be held in her old neighbourhood. Sensing an opportunity, Danny, Lady Caroline, Ali & the Asbo Twins commit to giving the old girl the wake to end all wakes and at the same time cement the reputation of The Marquess Of Queensbury as South London’s most up and coming gastro-pub. Death of a Nobody sees the much awaited return of Danny Bird and Lady Caroline in the Marq. For those not already acquainted with these intrepid sleuths, check out Death of a Diva, Derek Farrell’s début novel. I had the pleasure of reviewing it in November 2015 (Death of a Diva Review) and I can honestly say that I couldn’t see how Farrell would build upon these characters or come back with anything to rival this, but he has. Masterfully and effortlessly, a mind boggling plot is woven into the somewhat comedic tale of Danny Bird, running a pub for a gangster, attempting to rebuild his love life after it was turned upside down previously and keep his friendship with Caz as demented as ever. The wake of Lady Margaret Wright gives Danny the perfect opportunity to showcase this abilities in the kitchen and establish the Marq. as a gastro-pub, with waiting staff hired for the event and Caz helping in the kitchen there’s nothing that could possibly go wrong for Danny……that is until a dead body turns up and rains on Danny’s parade. Following his successful investigation of the murder of Lyra Day, Danny ropes in Caz as his incongruous Dr Watson, and the pair set about tracking down the motive and the killer. Add in the request to investigate poison pen letters and Danny is almost a modern day Poirot, except taller and has more hair. The evolution of Danny Bird is fantastic, Farrell seems to have brought this character fully out of his shell and he really shines like a peacock resplendent in the morning sun. Danny has honed his detective skills, so making deductions based on clever observations like scratches on the wrist push him towards a Sherlock Holmes-esque detective for this reader and really shows the attention to detail in the writing. I particularly liked the development of Caz. She really seemed come into her own in this book, and far from being Danny’s sidekick, she became more than just a main character, it was nice to see more sides to her. Snippets of her younger life (school days), her dabbling with a love life and attempting to dress down made her even more scandalous and riotous but still as delightful. The clever plot is well crafted, once Danny reveals all you really see just how fiendishly masterful Farrell is as a writer. Being a fan of crime fiction, thrillers and mysteries, I sometimes find that I can guess who the killer is or the eventual motive for murder in a book, but here I was clutching at straws. Each time I thought I had sussed the killer I was shown the error of my ways and was left bewildered until Farrell was ready to expose the killer and their motives. Subtly, behind the murder mystery is the idea that friendships and relationships and their value to us. Reminding us that failure and rejection are bearable when we have friends there to buoy us up. A wonderful continuation of the Danny Bird series, and I personally cannot wait to see what Derek Farrell has on the cards for Danny next!! 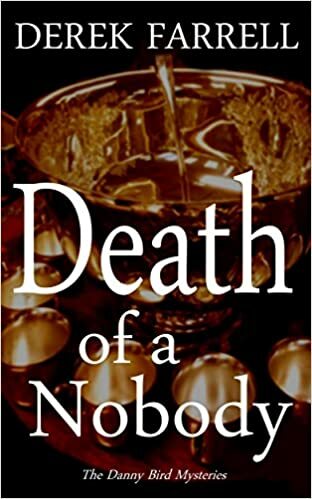 You can buy a copy of Death of a Nobody here. Watch out for more from DCI Erika Foster. She’s fearless. Respected. Unstoppable. Detective Erika Foster will catch a killer, whatever it takes. If you’ve somehow managed not to read The Girl in the Ice yet, I would urge you to do so. Not because you need to have read it for this book to make sense, but to experience the absolutely brilliant writing of Robert Bryndza some more. 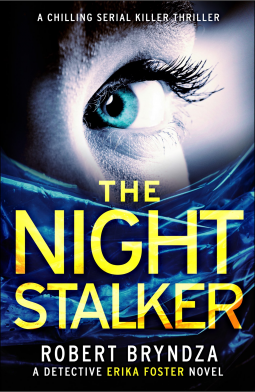 The Night Stalker sees the return of Erika Foster, the much loved damaged yet determined detective. Discovering a particularly nasty murder scene, Foster is adamant this is more than a “gay bashing” as her superiors believe, and is unwavering in her quest to prove it. When another body is discovered she knows a serial killer is out there and she will do whatever it takes to track them down and put a stop to their killings. But for Foster, this single-mindedness is also her downfall. Ignoring direct orders and tips offs, she takes risks that could put her in danger and jeopardise the case. The killer, dubbed The Night Stalker by the media, is a cleverly written character. Not once did I guess who the killer was until Bryndza was ready to hint at their identity. The back story of the killer was tragic but fascinating, the struggles with inner demons and outward tormentors was so carefully handled by the author. From just over half way through this book the pace and intensity really ramps up, and it’s almost impossible to put this book down! Character development was absolutely spot on here, more background on Foster and her marriage was definitely interesting, but for me the inclusion of life details for Peterson and Moss was brilliant. Bryndza listened to his fans and gave more on these characters which was great, but my favourite had to be the wonderful friendship that has blossomed between Foster and Isaac Strong. Dr Strong is a BRILLIANT character, almost as good as Foster I would say – so thank you for fleshing him out more! The characters are all realistic and engaging. To have written a brilliant story with so many strong characters is one thing, but here Bryndza has given the reader a carnival of characters and never once leaves any of them hanging….every one slots in to the story and action well, their presence or lack of in a scene is believably detailed. I would definitely say that Robert Bryndza is a name you should familiarise yourself with, he’s on his way to greatness. His books are going from strength to strength and I cannot wait for the next instalment of Erika Foster! The levels of technical detail in his work show just how much care and attention Bryndza puts in, and puts him up there with the greats of the genre. A must read for 2016!! You can buy a copy of The Night Stalker here. From the moment I read the description of this book I was hooked, what was the terrible thing? Who is Anna? Is Grace going mad? What danger is Grace in? The first chapter threw more questions at me and ensured I would read this in one sitting. Grace, Charlie and Dan were the best of friends from childhood, a bond so strong that saw Grace and Charlie more like sisters than friends so when Charlie disappears years later only leaving a cryptic message behind confessing to something terrible Grace is understandably confused, heartbroken and bewildered. The death of Charlie brings new heartache for Grace, and drives her to dig up the memory box they had buried together when they turned 16. Realising that Charlie never got to find out who her father was, Grace sets out to find him with the help of Dan, and soon Anna responds saying that she knows who the mysterious man is because he’s her father too, she and Charlie are half sisters. Jensen cleverly weaves between childhood and adulthood of Grace, recounting the adventures, the blossoming friendships and loves of the trio, to current day where Grace is 25, living with Dan in their cottage and attempting to take back control of her life after her breakdown following Charlie’s death. This style of writing gives a better insight to Grace as a character, explains why she is a hard character to like in the beginning and by the end you have a complete change of heart about her. I really enjoyed the way the intensity built up in this book, slowly little things creep in and you begin to wonder if all is what it seems. When mysterious things between Grace and Dan occur you begin to suspect that not all is well, but surely it can’t be anything to do with Anna? Anna seems to have formed a strong bond with Grace, so strong that their friendship almost emulates that of Grace and Charlie. The ending was well written, explanations were well thought out and believable, a little uncertainty about who ends up where or what happens in the future feels right with this storyline, and works well. For a début novel this is pretty impressive, the story is fantastic and well thought out, the characters are interesting, their development throughout really makes them stand out and feel real. I would absolutely recommend this book, although the temptation to read it in one sitting is hard to fight! 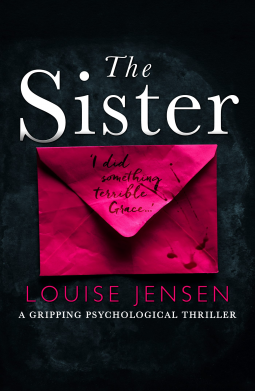 You can buy a copy of The Sister here. From the outset this book intrigued me, the description piqued my interest and had me dying to know where this went. From the first quarter of the book I was hooked. Telling the tale of the Duchess of Marlborough, Gladys Spencer-Churchill and weaving in the story of Laurel and Annie Haley, a mother– daughter, who like all mothers and daughters argue and attempt to let bygones be bygones, this book is about keeping secrets. The duelling of the stories of the women was interesting, and thankfully I made the connection quite quickly so this added to my enjoyment of this book. Annie‘s search for information about who this mysterious Duchess is and what relevance the book, The Missing Duchess that she has taken from her mother’s things is both interesting and fascinating to read, although it is somewhat marred by the fact that on several occasions Annie seems to act more like a troublesome 16 year old rather than a 20 something young lady engaged to be married. Narrating from different time lines, the story cleverly weaves back to the tale of the Duchess, to modern day with Laurel and Annie, and despite the shifts the writing was in no way lacking. Full of incredible detail for both times and full of secrets! There was one point I found my interest waned slightly in the middle of the book, but once a few secrets were revealed the pace quickly picked up again. This is a hard book to review in many senses as I really want to say “just wait for such and such bit” or “bet you won’t see x coming” but that would give too much away – the secrets/mysteries in this book are not ones you want spoiled for you. The note at the end from the author was a nice touch, ensuring that the reader knew just what was fact and what was fiction. So many have already remarked that they had not known that Gladys Spencer-Churchill was a real person, and indeed the reported facts about her were a surprise to them. An interesting read, and a healthy dose of historical fiction and fact to satisfy many readers, but perhaps not the book for everyone. 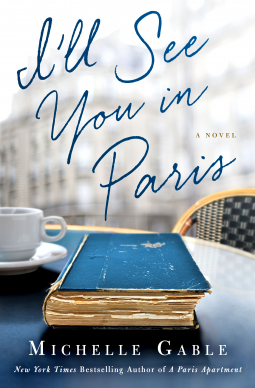 You can buy a copy of I’ll See You in Paris here. Set in Iceland the story initially focuses on two small-time crooks who rob a drug dealer and take two women hostage when their getaway driver doesn’t turn up. The four then head into the Icelandic wilderness looking for somewhere safe to hide from the Police, eventually ending up at an isolated hotel which has closed for the winter. Meanwhile the Police are investigating unconnected crimes, the disappearance of a mother and daughter and a house fire. As the investigations develop they eventually narrow down the search for the missing women. The interaction between the crooks and their hostages is delightfully entertaining, and the excellent pacing of the book makes this a gripping read. Bates opening with the fast paced action really grabs the reader from the start and keeps you hooked. Cleverly written, with unexpected twists, this is definitely a book that is right up there with the best of Scandinavian Crime Fiction. The characters were all interesting and dare I say likeable, even the “baddies”. The juxtaposition of Magni being a crook but also a likeable guy was cleverly done, and I really enjoy when an author can do this with a character. Bates also shows great skill when it comes to setting tension and vivid descriptions. Despite this being the fifth book in the Gunnhildur Mystery series, I read this as a standalone book. It works well on it’s own but I have to admit now that I’ve experienced this book I desperately want to go and seek out the previous four! 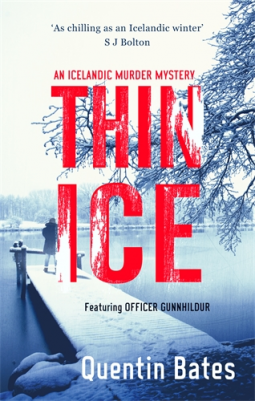 You can buy a copy of Thin Ice (Gunnhildur Mystery) here. May Day Murder reacquaints the reader with Whitstable and Pearl Nolan, the much loved restaurateur and private detective who wastes no time in delving into a good mystery. For fans of Wassmer’s Whitstable Pearl series this is the third book to feature the sharp eagle eyed detective and her eccentric mother. Dolly has lost none of her charm or quirkiness and if possible is even more entertaining that before, Pearl on the other hand seems to be have had the wind knocked out of her sails. Despite her best efforts her beloved detective agency hasn’t been as busy recently as she would have liked and her love life certainly hasn’t moved much either. When the reclusive star Faye Marlow is discovered murdered on the morning of May Day, Pearl’s detective instincts kick in. Who could have murdered Faye? What motive might they have had? As Faye’s past begins to unfold, Pearl learns some interesting things that may just prove vital in solving the case, but will she share these with DCI McGuire? The chemistry between Pearl and McGuire reached a pressure point in the last novel, he went to dinner at Christmas time with her and her family, but since then the pair haven’t kept in touch. Both thinking of calling the other but never actually getting round to it, so seeing the spark between them is still very much alive is a delight. McGuire’s unhappiness at Pearl’s detective agency is made very clear at times in the book, his struggle to not treat her as a colleague and discuss the case details as he would have done previously features but by taking this route Wassmer has opened up the investigation to allow Pearl to take the lead. The reader gets to see Pearl at her best, digging out the truth and making the realisation of who the murderer is instead of this taking the police procedural route with Pearl adding in the decisive information to wrap it up at the end. I don’t want to say too much about the plot or the twists that have cleverly snuck in to this book, it would give away too much, but this is a very enjoyable read. Julie Wassmer uses her great skills as a writer to set scenes that the reader can almost see. The descriptions of the restaurant, the ground of the stately home, the food are superb. Having never been to Whitstable I can honestly say that the images conjured by this book had be so intrigued that I had to go and look it up online to compare what I saw in my head with reality. I certainly wasn’t disappointed! This was a lovely read, a strong plot with plenty mystery to hold my attention and delightful characters that were both engaging and charming. As previously stated, this is the third book in the the Whitstable Pearl Series The Whitstable Pearl Mystery and Murder-on-Sea (Whitstable Pearl Mysteries Book 2) are both great reads. It is possible to read and enjoy this book as a standalone, there is enough back story given to explain things from previous books, but I would recommend reading them all as they really are a treat! 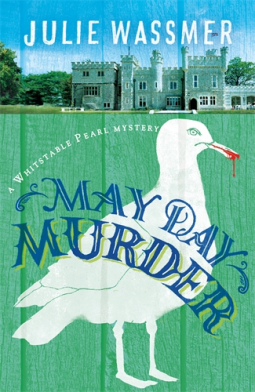 You can buy a copy of May Day Murder (Whitstable Pearl Mysteries) here.